A braising pan is like a griddle with high sides and a cover. This versatile unit can roast, fry, braise, boil, simmer, thaw, saute grill, warm, steam, proof, hold, and serve practically any menu item. Heating accomplished by electric elements embedded in a full 1-3/8” thick aluminum casting bolted to the underside of the pan for even heat distribution across the entire surface. Pan shall pivot on side trunions connected to the gear and control consoles. The consoles are drip proof, stainless steel clad and supported by an all welded 1-5/8” stainless steel pipe frame with front legs fitted with adjustable bullet feet and rear legs fitted with flange adjustable feet for securing to the floor. 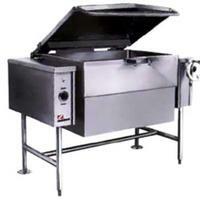 The worm and gear tilt mechanism allow the pan to tilt forward manually for complete emptying of contents. The controls are mounted in the left console and include a thermostat, power switch and pilot light. As a safety feature the pan is equipped with a high limit thermostat on each element assembly to shut down operation should the thermostat fail. Convenience features shall include a spring assist hinged stainless steel cover with handle and no drip condensate guide, vent port with swing cover and a removable pour strainer on the pour lip.